It is interesting that the basis for effective medicinal skills, strong martial arts abilities and even spiritual development all lay in a person’s ability to develop and cultivate Qi. The Daoist arts are very specific about this. Along with Qi development we must also learn to work with Jing and Shen; these three form the three sacred ‘treasures’ of the Daoist arts. It is for this reason that Nei Gong is at the heart of all the Daoist arts. In the third stage of training students learn to develop the three ‘treasures’ to a very high level as well as developing ‘Gong’ with the manner in which they use their Qi. As well as the ‘standard’ channels that most people are aware of, there are deeper channels that also require opening. These cannot be opened in the usual way but instead require a great deal of Qi development. Yin and Yang Qi are used together to awaken and activate these channels; on top of this we require a little help with transmissions that aid in their opening. We can use a combination of meditative exercises, moving practices and breath-work to help at this stage. 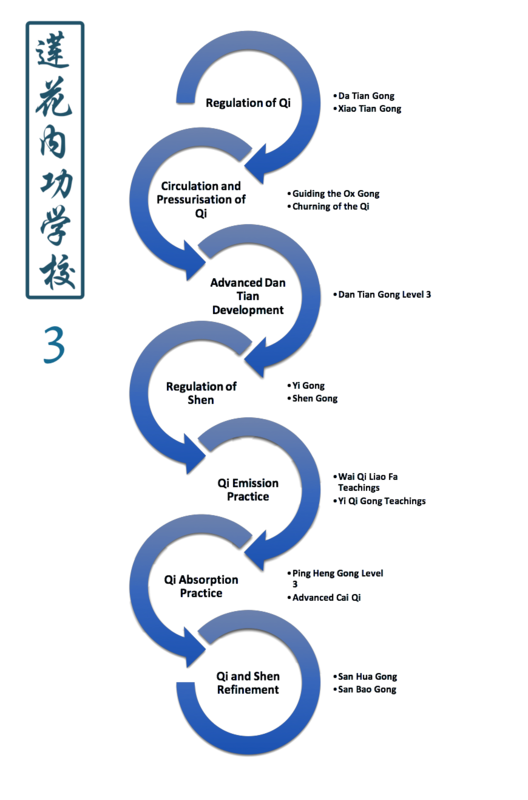 More specifically, we have continued development of the exercises based upon the myths of the Ba Xian or ‘eight immortals’ to help locate and lead Qi to these deep channels of the body. This stage of practice is very demanding and only the most diligent of practitioners may carry out this work. The ancient practice of ‘marrow washing’ can now start to be developed. To do this, students should have built a strong foundation in cultivation of Jing, Yin Qi and Yang Qi. These substances are then governed in order to clean the marrow and nourish the brain with extra energy. There is no set of exercises known as the ‘marrow washing exercises’; or at least no classical ones. Instead, it is a series of teachings and principles for dedicated practitioners of Nei Gong and Daoist internal arts. There is not much need to discuss level 3 training in detail on this site as it is a stage that needs very specific face-to-face instruction. We only include a short write-up here to help you understand exactly where the training goes. Though students in the school may wish to take their practice in different directions; medical practice, spiritual development or martial arts, the basis of all of this is that their Qi needs to be built to a very high level. In order to help in the development of expertise (Gong), we teach a number of practices aimed at governing Qi. Qi is controlled by the mind, taken in, built up and then finally emitted in very controlled and specific ways to help develop sensitivity and familiarity with Qi. The more we can gain control of the Qi the easier it is to govern. These all contribute to developing ‘Nei Gong’ – ‘mastery of the internal environment of our body’. The above (brief) description of training at all three levels within our school outlines to you the ‘outer door’ or public system that we teach. As well as this we also have an ‘inner door’ or private system of practice that only close students of Damo study. This is the way that traditional Daoist arts such as Nei Gong have always been taught. Inner door practices are for those who have shown the most dedication and aptitude for these practices. they are practices based primarily in the Daoist tradition itself as well as in development of teaching skills.